OPEN PDF On March 13 and March 24, 2017, 2 ship hijackings took place in Somali waters. These incidents highlighted the re-emergence of the piracy threat in the Gulf of Aden after a period of relative stability in the area. While the presence of international and regional naval forces has defused the piracy threat to a large extent since its peak in 2011, the phenomenon is far from being mitigated and the new increase in the Somali pirates’ activity has been observed particularly for the last 2 years. Piracy remains an attractive option for Somali coastal populations, especially in the context of illegal foreign fishing trade hampering the livelihood of local populations, combined with inefficient governmental public policies and the drought and famine endangering the country. The nearby Yemeni conflict further contributes to the destabilization of the Gulf of Aden, which consequently serves as a theatre of tensions between Iran and Arab coalition. On March 13, 2017, the United Arab Emirates-owned and Comoros-flagged fuel cargo ship “Aris 13,” travelling from Djibouti to Mogadishu and carrying 8 crew members of Sri Lankan nationality, reported being approached by 2 skiffs with armed men and sent a distress call, before the Somali pirates forced the ship to sharply alter its course for Alula town of the semi-autonomous region of Puntland and turn off its tracking system. The vessel represented a relatively easy target, as the fuel cargo ships are slow, heavy and difficult to maneuver, while in addition, “Aris 13” was allegedly navigating close to the coast, which facilitated its hijacking. The pirates later demanded a ransom for the release of the vessel. On March 16, 2017, Somali authorities exchanged gunfire with the ship’s hijackers, who were in the midst of resupplying themselves aboard “Aris 13” in an anchorage off the north coast of Puntland, close to Alula. Later on the same day, Somali pirates released the vessel and its crew unharmed, following the negotiations with the Puntland Maritime Police Force, local Somali authorities and clan elders of the Xabo region. Shortly after this incident, on March 24, 2017, Somali pirates seized a fishing trawler owned by a local businessman off the village of Eyl, also situated in Puntland, and forced its 10 Yemeni crew members and a Somali guard to disembark, while taking over the vessel with the food, the cook, the captain and the engineer. According to Somali police, the pirates now intend to use the trawler as a mother ship to conduct further hijackings in international waters. To remind, according to the statistics of the International Maritime Bureau, the pirates held over 736 hostages and 32 vessels at the peak of piracy expansion in the Gulf of Aden in January 2011. During the entire year 2011, overall 237 attacks were conducted in the area, while the global cost of these incidents estimated to $7 billion. Nevertheless, the number of attacks fell substantially due to shipping firms hiring private security guards, the vessels staying further away from the Somali coast, and the deployment of international counter-piracy task forces, as well as regional warships. It is worth mentioning, that this latter regional initiative was lately supported especially by Iran, whose ships and tankers have been particularly exposed to the piracy threat. - Since November 2008, the Iranian Navy has been conducting anti-piracy patrols in the Gulf of Aden shortly after Somali pirates hijacked the Iranian ship “MV Delight” off the coast of Yemen. - In January 2015, the Iranian Navy 33rd flotilla left Bandar Abbas port in southern Iran to be deployed in the Gulf of Aden within a newly announced counter-piracy operation. Consequently, on January 31, 2015, the Iranian navy managed to thwart a pirate attack against 2 oil tankers in the Gulf of Aden. - Later on, on March 20, 2015, Iranian naval forces thwarted a pirate attack against an Iranian oil tanker near the Bab-el-Mandeb Strait: pirates on board of 2 boats carried out one attack against an Iranian tanker, before being repelled by the Iranian navy; the pirates then came back 3 hours later with 6 speedboats armed with semi-heavy weapons, before fleeing the scene again after several hours of clashes with the Iranian forces. - In November 2016, the Iranian Navy Commander Rear Admiral Habibollah Sayyari announced that since the beginning of the operation, his forces deployed in the area have escorted 3,844 cargo ships and oil tankers so far. The decrease of piracy threat in the Gulf of Aden had also seemed to be further illustrated by the pirates opting for demands of ransom for previously kidnapped victims, rather than conducting new attacks. These ransoms allowed the pirate groups to subsist and to maintain their networks. On February 25, 2015, 4 Thai fishermen held hostages by Somali pirates were released in Galmudug State, after a $150,000 ransom was paid for their release. The 4 hostages were among 24 crew members kidnapped in April 2010 when pirates hijacked the Taiwan-flagged fishing vessel “Prantalay 12,” while the ship was then used as a pirate mother ship to launch attacks far off Somalia before it capsized in July 2011 and the crew was taken ashore. On October 22, 2016, 26 Asian sailors held hostages by Somali pirates were released in exchange for a $1.5 million ransom, after being kidnapped in March 2012 from the Omani-flagged fishing vessel “Naham 3” near Seychelles. 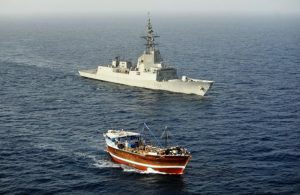 As such, due to the above described general decrease in piracy threats, the hijacking of “Aris 13” has been characterized in international media as “the first pirate incident in Gulf of Aden waters since 2012.” However, this is not the case: while the presence of foreign naval forces defused the piracy threat to a large extent, the phenomenon has been far from disappearing and the new increase in the Somali pirates’ activity has been observed for the last 2 years. - On March 25 and 26, 2015, 2 Iranian vessels “Jaber” and “Siraj” fishing illegally off the coast of Somalia were hijacked by pirates off Ceel Huur in the Mudug region. In August 2015 the kidnapped crew managed to escape, while the incident remained scarcely mediatized due to the illegal nature of the vessels’ activities in the area. - On October 22, 2016, the chemical tanker CPO Korea was attacked by Somali pirates in the Indian Ocean some 330 nautical miles east of Somalia: the tanker was approached by a fast-moving skiff with 6 armed men on board, who exchanged fire with the security guards on board of the vessel, although eventually they did not manage to reach the ship and fled away. - More recently, on February 13, 2017, the Iranian Navy's 44th flotilla of warships repulsed a massive pirate attack of 11 Somali pirates’ fast boats against an Iranian commercial vessel in Bab al-Mandab Strait, situated at the estuary of the Red Sea to the Gulf of Aden. The return of piracy to the Gulf of Aden is partly linked to the international counter-piracy forces decreasing their presence in the area, as illustrated by NATO ending its anti-piracy mission “Ocean Shield” in the area in December 2016. The piracy is also often chosen as the only job alternative by local youth and as such remains a backbone of local economy, due to the lack of efficient public policies and alternative sources of independent revenues, especially in view of the drought that Somali government recently declared as a national disaster and an impending famine in the country. The rampant increase in illegal fishing by foreign-flagged vessels in Somali waters has also played its role, having nurtured the animosity of coastal communities, who had been largely dependent on the fishing as the mean of livelihood. According to the chairman of the Somali Fishermen’s Association, the fake fishing licenses have been allegedly often issued to foreign fishermen, while local authorities remained negligent in enforcing the regulations against these. Numerous local fishermen have also abandoned their work in favor of piracy following the danger linked to harassment by these foreign illegal fishermen: several cases of attacks by these were reported, including close-ramming of the local fishermen’s boats by trawlers, robbing them of their catches, or opening fire against them. Earlier in March 2017 one fisherman was killed and another one severely wounded after a foreign trawler deliberately ran over their skiff. This aspect was further illustrated by the hijackers of “Aris 13” reportedly sending a message to Somali authorities, claiming that they captured the vessel not to obtain the ransom, but to protest against this phenomenon of massive illegal fishing. The piracy threat in the Gulf of Aden is further influenced by the nearby Yemeni conflict, with Houthi (Zaidi) rebels suspected of having perpetrated several maritime attacks in Bab al-Mandab Strait. - On October 1, 2016, UAE-operated catamaran “HSV-2 Swift” was severely damaged and 3 of its crew members wounded after Houthis fired several Noor missiles against the vessel. - In the first half of October 2016, the U.S. Navy vessels “USS Mason” and “USS Ponce,” dispatched to the area in response to the incident, were targeted by suspected Houthi missiles several times. - On October 25, 2016, an LNG carrier “Galicia Spirit,” operated by Spanish military company Teekay and transporting gas from Qatar, was attacked by Houthi fighters on a fast boat who fired against the vessel with rocket-launchers, before their boat exploded: the authorities suspect that the rebels initially intended to conduct a vessel-borne suicide attack. - On January 30, 2017, a Saudi frigate navigating near the port of Al-Hodeidah was targeted by vessel-borne bomb attack of 3 boats, which resulted in 2 explosions killing 2 people. The attack was claimed by the Houthi militia Ansar Allah. New tensions arise therefore in the context of Iran implicitly supporting the Houthi insurgency and Arabic coalition forces supporting the Yemeni President Abdo Mansour Hadi, since both sides have deployed their naval forces in the Gulf of Aden: in addition to the Iranian navy patrolling in the Bab al-Mandab Strait, the UAE recently announced signature of an accord with the secessionist state of Somaliland in order to establish an Emirati military base in the city Berbera. The March 2017 hijackings in the Gulf of Aden thus do not represent isolated incidents, but rather confirm the trend of the piracy re-emergence in the region, this time also re-framed by the influence of the Yemeni conflict. While the previous reinforcement of security forces in the Gulf of Aden had reduced the influence of pirates, they functioned as a force of dissuasion, rather than a long-term source of deeper transformations in the area. As such, the growing intensity of attacks is due to further endanger the strategic global trade route of the Gulf of Aden in the future.